This was Nissan's second car, an early Bluebird. Nissan started life as a car manufacturer making OEM cars for Austin UK. 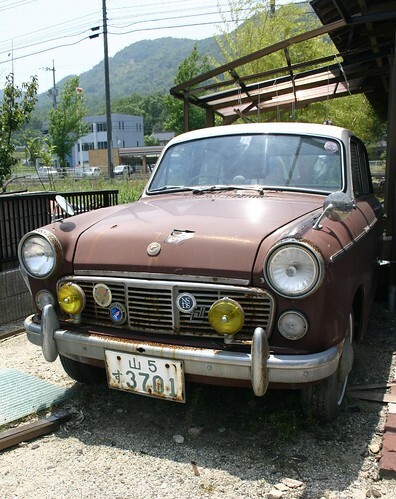 As this was one of the first cars that Nissan made on its own, the Austin style is still to be observed. Nissan of course went on to become one of the leading car manufacturers in the world, and for a long time the second biggest in Japan. Today there are very few cars manufactured in Britain other than those made OEM for Japanese manufactures. The tables have been turned, almost completely. I say almost because, Nissan was recently purchased, or part purchased by the French car manufacturer Renault, and this despite the fact that Nissan makes much better cars. Very few Renault cars are sold in Japan, where as Nissan cars are fairly popular in Europe, and have to be limited by "voluntary restrictions". Nissan is good at manufacturing but poor at financial planning. Renault had lots of cash but did not want to invest in its own manufacturing. Hence the Renault investment in Nissan. A marriage made in heaven. As a Brit I only wish that it could have been Austin Rover that had the cash left to purchase Nissan.